"Your work is not supposed to make you feel amazing and wonderful all the time. It’s work." Exactly. It's work. Its called work because its work. Its not called "happy fun time". I don't really understand why this expectation that we should love our work started and why so many people buy into it. I mean what if I started preaching to everyone that you ought to love mopping the floors? If you don't love mopping your floor then you must be doing it wrong. Keep changing how you do it until you love it. If you don't love it then you're the problem. Is the floor too big? Well maybe you should downsize your home. Buy different mops. Get one of those robot floor things. I LOOOVE mopping my floors and you should too. You don't like mopping? Its you... you're broken. The only true way to live your life is through loving mopping. Yet so many people want to accept the idea that we should love our jobs. Why should I be expected to love work any more than I love household chores? Right about now theres someone out there thinking how they actually DO love household chores. That person will comment how they love mopping. This just adds to the silly argument. Of course some people love mopping floors and some people love their jobs. But you people are in the minority and that doesn't mean the rest of us are supposed to change our lives to match you. But those people will be held up as the example. See? If Bob loves mopping floors then it can be done. Look at how happy Bob is. Why are you so miserable? You must be doing it wrong. Have you tried a different brand of cleaner? We mop the floors because its necessary. We don't have to love doing it, but we do have to do it. Jobs are similar. People work at a job because its necessary to earn a living. You don't all have to love your job but you do have to make a living somehow. My wife and I started house shopping in Sept 2010. We were still shopping in March 2011. Our home search continued in Sept. 2011. We're still looking after about 18 months. The market was fairly slow over the winter months and the house shopping slowed down since nothing much appealing came up for sale. There were a few houses that came by that were interesting but not a lot. In the past month or so the market has really started to get more active and we're seeing several homes put up for sale each week. After many months of searching we actually finally made an offer on one house only to end up being outbid by a competting offer. That experience was a little frustrating. We actually looked at the house then didn't make an offer fast enough before someone else made an offer and a sale went pending. Losing it disappointed us, but then a few days later that deal fell through and we were able to put in our offer. But the day after our offer the original deal was back on and we lost out. It was a nice house in a great neighborhood. The price was around $450,000 and I don't recall exactly how much we offered. Since it was priced pretty low, I don't think we offered much lower than asking. This week we finally gathered up all the documentation required to get a pre-approval on a loan. I submitted the documents to our mortgage broker earlier this week and I'm waiting on the results. We have had a pre-qualification for a long time but thats not the same as a real pre-approval. The pre-qualification is more of a 'rough estimate' on our qualifications. At least thats my view of it. The pre-approval however is an actual approved mortgage amount. We wanted to get pre-approved for a couple good reasons. First it will help us make a quicker purchase. Second, having the pre-approval already done will also tell us how much of a mortgage we can actually qualify for. The broker indicated we'd qualify for a loan much larger than we really want, so I don't expect a problem. The whole time we've been looking our cash balance has gradually grown. At the same time the prices of homes have gone up and down a little bit. Today interest rates are at 30 year lows at around 3.7% level. Combined these trends have made a house more affordable as far as impact to our bank balance and in terms of the monthly mortgage payment. The cost / sq. ft. figure quoted above is the median for the ZIP code we're looking in. The actual homes we've looked at vary quite a bit. In the past coule weeks we've seen homes that would come in at $148 / sqft versus $193/ sqft. The first was a foreclosure that needed some work and the other was a pretty nicely updated home in a nice neighborhood that was probably over priced. Right now we've mostly settled on a home of around 2700 sq. ft. in size. It seems that what we want in a home fits at that size roughly. We've also gradually increased the price of homes we've looked at up to the $500,000 level. As we looked at more and more homes and failed to find what we want, we gradually looked upwards in price. This is of course not a great trend, I'd of course much prefer that we could find a home we want for dirt cheap. But we're found that the kind of homes we want are closer to $450,000 to $500,000 range. The lower interest rates and more cash in our bank account has made it feasible for us to consider spending a bit more. One major aspect of retirement planning is the tax bill you'll face in retirement. Figuring your future tax bill has a couple major implications. First the tax expense itself is a major line item in your budget and you should plan appropriately. You don't want to figure out a post-retirement budget and totally neglect or severely misjudge your tax obligations. Also the taxes you pay in retirement will help determine if a pre-tax retirement fund or post-tax retirement fund is appropriate. Most people face lower tax bills in retirement. Income is lower and senior citizens get some special tax breaks. There is a common fear today that taxes will inevitably go up in the future. This may be true to some extent but taxes are quite variable based on income level and its unlikely taxes will go significantly for low/middle income earners. Overall though the tax breaks and lower income of retirees should generally outweigh future tax hikes. There is a general exception to this. If you are in the top tax bracket during your earning years and you also expect to be in the top tax bracket in retirement then you may see higher tax rates post-retirement. But that situation likely only applies to the top 1% of income earners in the population and for the other 99% of us we're much more likely to see lower tax rates post retirement. Taxes post-retirement come in several forms. WE pay taxes to the federal government, usually states have income taxes and property owners have property tax bills. Lets look at each of these and discuss how your tax rates could change after retirement. For example sake lets say you currently make $100k in wage income today. You are in the middle of the 25% tax bracket. You also normally pay 7.65% into social security and medicare. Thats a combined marginal tax rate of almost 33% and an effective tax bill of approximately 20% or $20k. When you retire you stop paying SS/med so thats a 7.65% tax cut effectively. But of course you don't still have that $100k income and you probably have more like $80k right? Since you were making $100k you have a good SS benefit and $25k of your income is SS. Only 85% of your SS is taxable so thats more like $76k taxable income. That $76k taxable income would put you in the 15% margin bracket in todays rates and give you about 10% effective tax rate or $7600. So if nothing changes in the tax laws and your income pre-retirement is $100k and $80k post retirement your tax bill will drop by approximately $12,400. The effective tax rate will go from 20% to 10% and your total marginal bracket including FICA will drop from 33% to 15%. Do you think that marginal taxes rates are going to go from 15% to 33% for retired people making $80k?? Do you think politicians are going to double the effective tax rates for a married retired couple from 10% to 20%? I sure don't. That's kinda silly. For anyone who thinks this is feasible or likely within the next decade or two then I'd challenge anyone to find two politicians in our federal government who want to raise taxes on ANYONE by 18% marginal. You may have notice I put a qualifier of 'within the next decade or two' in that last sentence. I would admit that 40 or 60 years from now things could radically change in our government. It was only 50 years ago in the 1970's when top marginal tax rates were 70% and now the top rate is currently half that at 35%. You really can't plan for 50 year time periods. 50 years from now the Martians may have taken over after we blow ourselves up with a nuclear war with India after the solar flares knock out all the electric grids and the zombie apocalypse... oh.. sorry.. what were we talking about? Oh Yes, taxes in the distant future are anyones guess and not something you can predict nor plan for. If you'd have told your grandparents 50 years ago that taxes would be cut in half by now they'd have probably scoffed at the idea, yet it happened. Nobody can predict government policy 50 years into the future and anyone trying to do so is just taking blind stabs in the dark. The majority of states do not tax social security. That is probably the biggest reduction in state taxes for retirees. States also usually have some sort of income tax cut for senior citizens. Usually there is a larger exemption of some sort. So often your tax bill is a little lower simply due to the age based benefit. Many states do not tax pensions in general : Alabama, Hawaii, Illinois, Kansas, Louisiana, Massachusetts, Michigan, Mississippi, New York, and Pennsylvania. Few people have pensions nowadays but for those who do this can be a considerable benefit in some states. Between the various tax benefits for senior citizens in the various state income tax systems, most retirees will see sizable drops in their state income tax bills post retirement. But this is quite dependent on the state and your financial specifics. I won't make any broad generalizations about the future of state taxes since we've got 50 different states with varied fiances and political climates. Lets look at an example. Say you live in California with its relatively high state taxes. Pre retirement you have an income of $100,000 and your CA tax bill is around $3700. Post retirement your income is down to $80,000 total but they don't tax the $25,000 from social security so your taxable income is just $55,000. Also CA has an extra tax credit for senior citizens. As a retired couple with $80,000 income your CA state income tax is down to just $652. Thats about a $3000 tax cut in your state taxes after retirement. Of course every state is different and state income taxes treat retirees differently. In some states you may not see a significant change in your state tax bill and in other states your taxes may be dropped to zero. The future could hold anything here as well. This one varies from state to state generally and may also vary between cities or counties within each state. So there are likely 1000's of different systems for property taxes across the nation. However many states and local governments offer deferrals, discounts or exemptions on property taxes for senior citizens. Usually such programs have an income limit but many seniors can qualify. Going back to the California example. Say you live in San Mateo county. There is a program in CA which gives property tax assistance for seniors and disabled individuals but they limit it to people with incomes under $40,000. In our example the post retirement income is $80,000 total so that would be too high to qualify for the property tax assistance. Most of the other taxes we pay are consumption taxes based on a % of purchases. General sales and excise taxes fall into this category. I don't know of any special sales tax rates for retirees so I don't expect thats common at all but feasibly I guess it could exist somewhere. For the most part though I think sales or excise taxes are pretty predictable as a % of your spending and likely won't vary post -retirement other than any changes in spending amounts. Estate taxes are another major category of taxation that some retirees do need to be aware of. Estate taxes however only come into play if you're a millionaire. If you are a millionaire and likely subject to estate tax then I'd recommend working with an estate planner. Whats a Jumbo Loan? Why should you care? My wife and I have been gradually home shopping. We're in no rush to buy but still looking since prices are good and interest rates are very low. I was talking to our mortgage guy and he pointed out that the maximum loan before you get to the "jumbo" loan is $417,000. (The limit is higher $625,500 in Alaska, Hawaii, Guam & U.S. Virgin Islands). Simply put a jumbo loan is a loan that is larger than the government sponsored FannieMae or Freddie Mac will purchase. Normally Freddie / Fannie will buy loans from banks. To sell a loan to them the bank needs to ensure the loan conforms to standards. Such a loan is a 'conforming' loan. But Freddie/ Fannie won't buy very large loans and the limit is the threshold between a conforming loan and a Jumbo loan. Jumbo loans are the term for loans larger than the amount Freddie/Fannie will buy. Jumbo loans are a bit riskier and harder to resell for the banks. Therefore they charge higher interest for a jumbo loan. How much more do they cost? The spread between a conforming loan and a jumbo loan is generally between 0.25% and 1%. Lets look at an example : I compared the rates for a $416,000 conforming loan and a $418,000 jumbo loan on Amerisave. The conforming loan could be had for a 3.625% rate with $404 in points/fees and the jumbo loan was 4.375% with $108 point/fees. Thats a 0.75% spread. The payments were $1897 and $2087 for the conventional and jumbo respectively. Thats a difference of $190 per month at todays low rates. Thats a pretty big deal. If you can help it you should avoid jumbo loans. Of course you don't want to pay an extra 0.25-1% on your mortgage if you can help it. So you should do what you can to stay within the conventional mortgage guidelines and avoid jumbo rates. One tactic is to bring more money towards the downpayment to avoid the higher interest costs. For my example above the loans are on the threshold and the $418,000 loan would cost you $190 less per month if you brought $2000 more to closing to instead borrow just $416,000. Of course few people are borrowing just at the verge of Jumbo rates and its harder to bring $100,000 extra to the table if you want to borrow $515,000. Another way to try and avoid a jumbo rate is to get a secondary mortgage on top of your primary. So if the house costs $600k and you have $120k for a downpayment thats still a $480k loan which is in the jumbo range. If you get a $400k primary loan and a $80k secondary loan then your primary would be a conventional rate loan. Such second mortgages can be harder to qualify nowadays. A few days ago I looked at some financial predictions for 2012 that were reported by Money magazine. It was a mostly mixed bag of failure. I found 3 more general economic predictions in that issue and we'll talk about those today. Keep in mind these predictions are for the year 2012 and we're only about 6 months past when the magazine was pointed. On page 86 the magazine indicated an expectation that unemployment would be 8.5%. Today the April 2012 unemployment rate sits at 8.1%. Housing -- Forecast : Sales of 4.8M homes and prices up 0.25%, Actual : sales 4.6M and median prices up 10%. Page 74 they said that 'The median expectation among more than 100 economists and real estate pros surveyed by MacroMarkets is that home values will inch ahead by a mere 0.25%." and that "Freddie Mac forecasts that only 4.8 million homes will be purchased in all of 2012" The reality so far in 2012 is a bit different. According to a Bloomberg article the sales are at a 4.6 million annual rate as of April but median prices have jumped 10% year over year from $161,100 in April '11 to $177,400 in April '12. Money reported a tweet from Suze Orman she made in Oct. 2011 where she predicted that gold will be "$2100 by 11/2012" and recommended having 10% of your portfolio in the shiny stuff. I found her reiterate the $2100 target on Nov. 10th last year Gold started the year 2012 about $1600 and hit a high of $1781 in February. Today its back down to $1570 level. Unemployment is 0.4% better than they expected, Home prices are up 10% and gold has not gained the $500 or +30% increase per Ormans prediction. We'll have to wait till the end of the year to make a final conclusion. But for now the forecasts aren't proving very accurate. fivecentnickel discusses how to handle a Bank Error in Your Favor? Its generally not a good deal since there are fees in the 2-4% range but it might help you max out some credit card bonuses. and FMF also tells us that “Do What You Love” Is Bad Advice which is a feeling I've shared in the past. Yesterday we looked at credit ratings for nations. Today we'll look at the ratings for individual U.S. states. Here is the list of the S&P ratings for state governments as of July 15 2011. The ratings do change gradually over time but only gradually. The table I got the list above from was on the PewStates.org website. They also have an info graphic that shows the history of upgrades and downgrades for each state from 2001 to 2011. The TaxFoundation website put together a nice graphical map showing the ratings by state. The actual data is from Standard & Poor and they have specifics for each state buried among all the municipalities of each state on their website. BUT.. you may need to register and log in to get to full reports. Citation: How Moody's, S, ChartsBin.com, viewed 22nd May, 2012, . The embedded graphic doesn't fit very well into my article column. If you have difficulty with this version then visit Chartbin directly for the full size version. BestBuy has $100 iTunes gift cards for $80 right now. You can get either the electronic email version or a physical card mailed with free shipping. This is a sale price and I do not know how long it will last. I know a lot of people use iTunes and and it seems to me that 20% off is a pretty good sale price. I'd link to Ebates for an additional 1-3% cash back reward but they don't give cash back on gift cards. I was thumbing through a back issue of Money magazine that I had lying around my house. The Money issue interested me because it was the December 2011 year end issue with the cover declaration 'Make Money in 2012'. Its about 6 months later so I thought it would be fun to check in on some of their advice and predictions and see how well they've fared. Nouriel Roubini : "Favor U.S. stocks over European equities." Peter Schiff : "Avoid dollar-denominated assets. Buy gold and silver." Marc Faber: "Keep a quarter in cash, a quarter in gold, a quarter in real estate, and a quarter in stocks." Henry Kaufman: "Buy stocks in firms with strong balance sheets". Silly thing is that they can't all be right because for the most part they contradict one another. For example Roubini and Schiff seem to be directly at odds. Who do trust? I think its anyones guess. Roubini: All he's saying is that he thinks the U.S. market will perform better than European. We can check that by comparing board U.S. based market index versus a European index. For Europe we can use VEURX. It was trading at $22.93 at the open of the year and is now at $21.64. Its down 1.3% In the US we can use the VTI ETF. VTI opened at $65.41 and is at $67.65 today so its up 3.4%. Schiff : The advice here is to just buy shiny metal. Kitco has data on historical gold and silver prices. Gold opened at $1598 per ounce and is currently at $1592. Thats a loss of 0.3%. Silver opened at $28.78 and is now at $28.39. Thats a loss of 1.3%. Kaufman : Buying stocks with strong balance sheets could be a little vague but I would interpret it to mean stocks that are in a 'value' segment. I guess you could also assume he means large cap stocks but large cap companies aren't all necessarily carrying strong balance sheets. Working with the assumption that he means value stocks I'll pick the VIVAX fund to represent value performance. VIVAX opened the year at $20.79 and is now at $20.79 so it is flat so far. Roubini : CORRECT - his prediction that U.S. markets would be better than Europe is right so far and the U.S. index has gained 4.7% more than the Europe. Schiff : WRONG - gold and silver has lost value so far and underperformed stocks or cash. Faber : MIXED - His investment strategy underperformed the broad US market but not drastically. Having 25% in cash makes for a more conservative investment. Kaufman: USELESS - Maybe thats a little harsh or blunt on my part but honestly I think his recommendation is too vague to be of much use. He's basically just saying that you should pick good stocks. OK. Is that ever bad advice? Should we buy stocks with weak balance sheets? This is a pretty mixed bag isn't it? Seems to me you could have just randomly picked a investment strategy out of a hat and done just as well. Of course the year isn't over yet. I don't mean to pick on these four guys, they just happened to be the four people highlighted in the article. They of course aren't the only pundits that are wrong in hindsight. Various guru's have a poor track record. Jim Cramer can't beat a monkey at picking stocks. Meredith Whitney wrongly predicted that the government bond market would be hit with significant defaults. Of course I'm no better my own attempts at predicting the future have a pretty poor track record as well. I personally don't think we should trust the talking head financial experts very far to predict the future of the economy. It seems more often than not their guesses are no better than flipping a coin. Right now you can get a $2 MP3 credit from Amazon by sharing your favorite song via Facebook. According to the Society for Human Resources Management the average wage increase is expected to be 2.9% in 2012. On the other hand inflation from April 2011 to April 2012 is up about 2.3% and it was up about 3.2% for the year 2011. Getting wage data for private industry and the CPI data from the BLS. 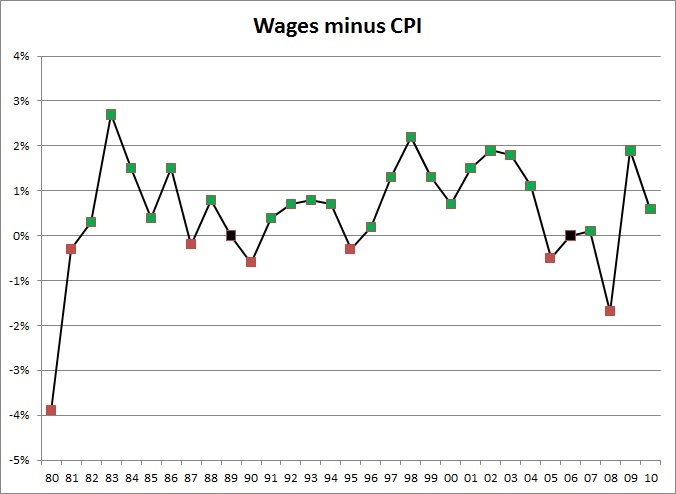 We can compare how wages have trended over the past few decades and how wages compare to the inflation rate CPI. 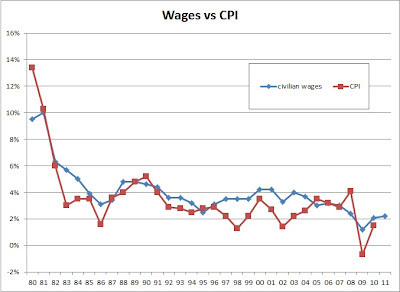 First lets look at how wages versus CPI have trended. Click chart for full size image. For the most part the increase in wages has been a little higher than the CPI rate. Thats a good trend for workers in general. It means our income has out paced the cost of goods. Lets look at the difference between wages and inflation. Here I just plot the annual % wage increase minus the CPI increase. So any figure >0% means the wages went up faster than inflation for that year. The positive values are shown in green and the negative amounts in red. 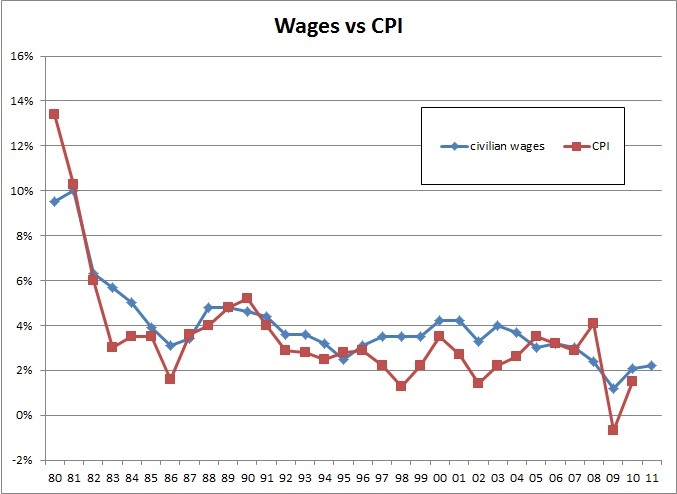 A couple times the wage increase and CPI were equal so the difference was 0% and I show those in black. 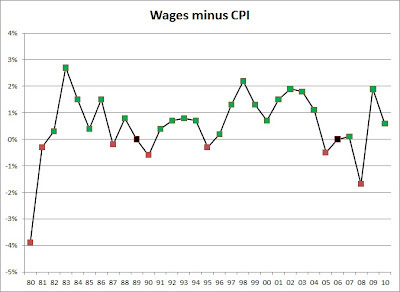 Most of the time wages outpaced inflation and the green data points outnumber the red by 22 to 7. Of course this is just the nation wide average data. Some industries and professions have fared better than others. An individual persons wages are not likely to have moved in step with national averages. The idea is a simplistic concept that if you follow your passion that you'll end up with success. I'm sure the people pushing this idea really don't intend it to be misinterpreted such that 18 year old kids assume they can go get a bachelors degree in 13th century Norwegian literature at some obscure private school and then somehow become gainfully employed and pay off their $80,000 in student loan debt. But without some ground rules and basic common sense application of the 'follow your passion' mantra, individuals may misapply the idea and assume that they need nothing other than passion for the success to follow. Lets at least make sure someone else cares about your passion. I used to joke that I didn't think that my passion for playing video games on my couch would make me rich. Clearly your passion has to be associated to something someone else would want to pay for. This is where the usefulness requirement comes in. Better. Thats an important step in the right direction. It should make it clear that I will not get rich any time soon by following my passion for video gaming on my couch. Its definitely very important that people realize that simple passion doesn't equate to monetary success. Your passion has to be combined with something of use. Again, this should really just be common sense. But unfortunately I don't think the point is emphasized enough when some people preach the 'follow your passion' mantra. Readers may mistakenly assume that passion alone is good enough. Just because something is valuable doesn't mean it will lead to a good job or success. Is passion and usefulness sufficient to create success? No. There are numerous factors in success. You won't find success if you're creating something of no value, but just creating something of value won't always lead to success. My 401k provider at work made #1 on the ranking and my personal IRA is #2. DQYDJ asks Who Will Rate the Raters? The Analyst Crisis on Wall Street. Right now you can an Entertainment coupon book for $12 with free shipping plus get 26% cash back from Ebates. After the rebate (26% X $12 = $3.12) you'll end up paying $8.88. The Ebates website says that the discount expires 5/21 so you've got a few days to act if you're interested. I pointed out late last year that the books go on sale in the summer. Back in April the books were on sale it was for $10.63. Now its down to $8.88. So far I'm being proven right about the prices dropping in the summer months. You probably know by now that the cost of college has been going up faster than inflation for a while. When I went to college my tuition was about 1/4 of what you'd have to pay today for that school. Thats about 7% annual increase and close to 2.5 times the rate of inflation in the same period. OK.. but I didn't pay full tuition then and I probably wouldn't pay full tuition today either because of financial aid. 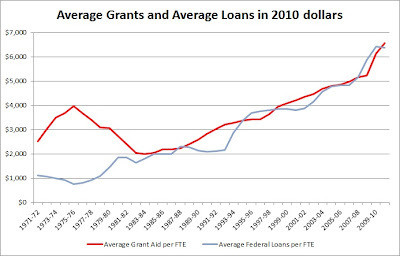 How has financial aid trended over time versus the cost of college? I got all the data I'm using today from the College Board Trends in College Pricing with data from their Excel sheet and their Trends in Student Aid along with the data in Excel. I'm going to look at all the figures in current 2010 dollars. So this is all inflation adjusted. I think that makes more sense than looking at the actual dollar figures since $1000 in 1980 was a lot more money than it is in 2012. 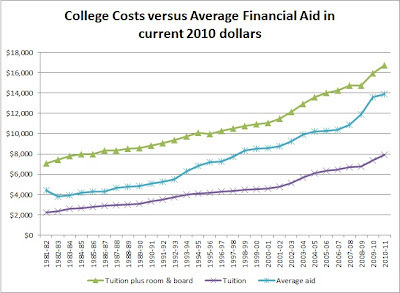 But you can still see from the charts below that college costs are rising even after accounting for inflation. I'm also only looking at public four year universities. Costs and aid for private or 2 year schools are different. Financial aid is mostly need based so the amount of aid available to you will depend on your income level and family assets. I'm looking at just the average financial aid amount for all students, but this will differ greatly if you're low income versus high income. If you're in the higher income levels then the amount of financial aid won't really impact you, but most families do get some financial aid so I think it makes sense to consider it in general. 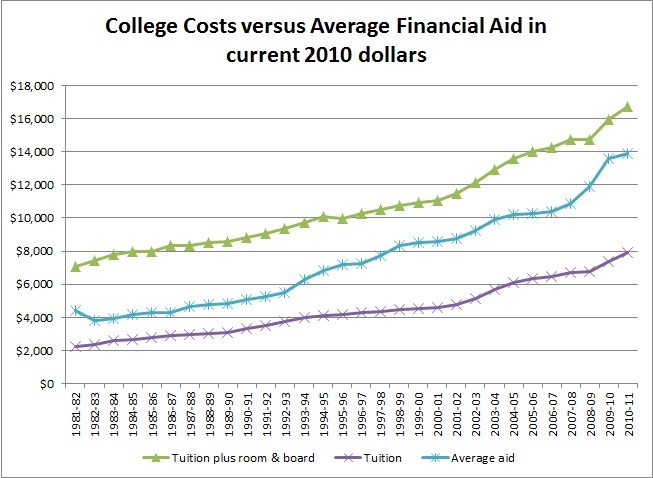 The green line is the total tuition and room and board cost so thats the full sticker price for college. Purple line is just the tuition cost. 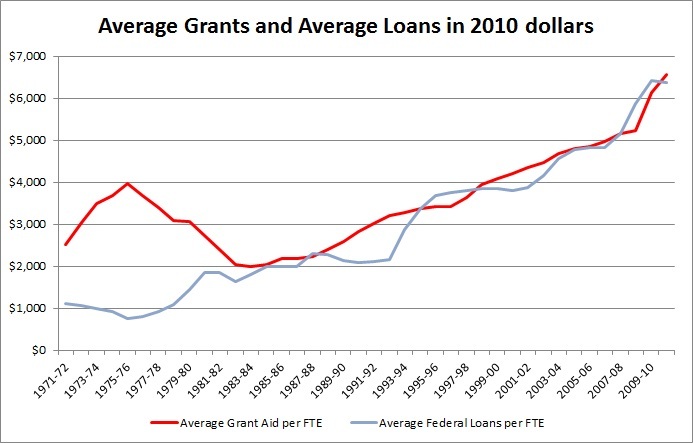 The blue line is the average financial aid per student. As you can see the financial aid at public universities is keeping pace with the cost of college after adjusting both for inflation. After figuring in the average financial aid given to students we can figure out the actual net cost of college. An individual student doesn't typically pay the full tuition rate but they instead pay the difference of the tuition less their aid award. 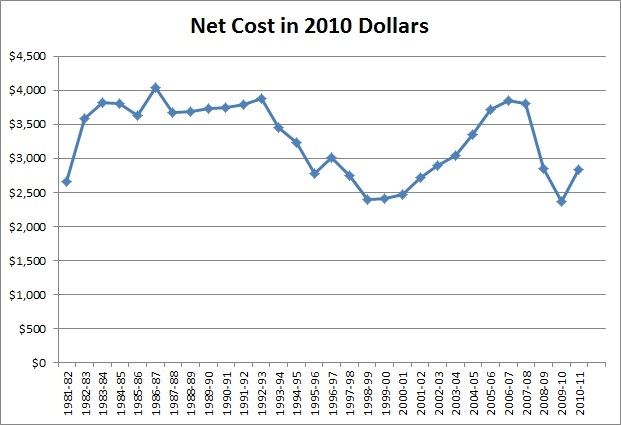 I think this net cost of college is a better indicator of college affordability in general. 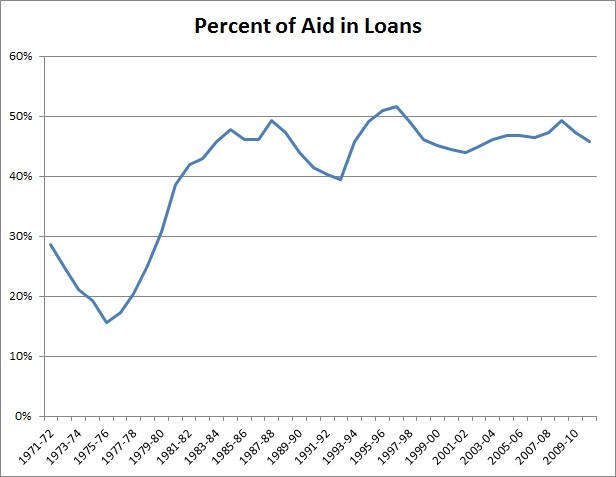 Here we can see that the net cost of college after aid is not gone up in the same way as college costs have over the years. In fact today after taking account of inflation the net cost at a public university is actually lower for an average student than it was when I went to college. Of course theres a major 'gotcha' in that last statement because a lot of the financial aid given to students is in the form of student loans. So are we just shifting more of the cost of college into student loans? 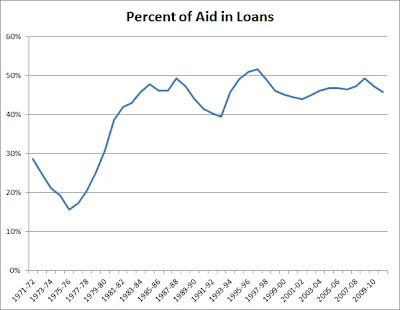 Since the early 80's the financial aid has been made of 40-50% loans. Students of course have to repay the loans. I certainly wouldn't consider that 'free' money so we should account for the cost of the loans when looking at the students real costs. I'll figure the 'real' cost of college by taking the tuition plus room and board then subtracting the average financial aid to get the net cost then adding back the average loan award. The real cost is then equivalent to the full retail tuition and room and board minus the free forms of financial aid such as grants and tax benefits. 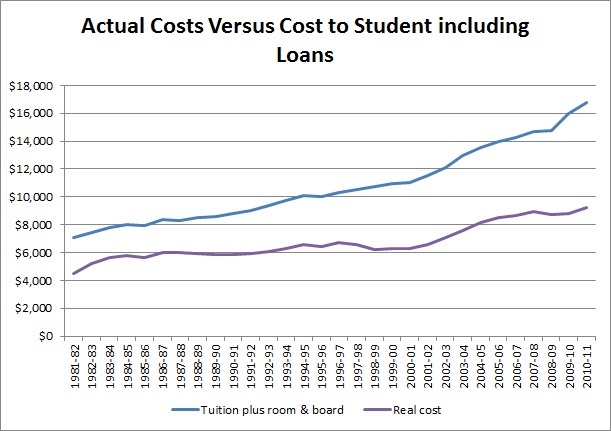 The purple line is the 'real cost' of college. This is what an average student actually ends up paying either out of pocket or via loans. As you can see in the chart the real cost was fairly flat from the mid 80's up until about 2000 when it went from $6033 to $6269 (in inflation adjusted numbers). But in the past 12 years the real cost has risen considerably. 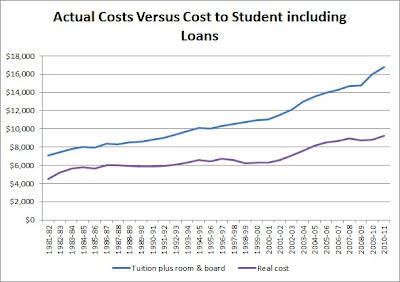 From 2000 to 2011 the real cost of college has gone up 3.8% a year even after figuring in inflation. Again, as a reminder theres several details about this analysis: I'm looking at inflation adjusted dollars, this is only for public 4 year universities and of course the amount of financial aid varies considerably based on your income and financial situation. Furthermore the situation varies 50 different ways based on how the 50 individual states fund their universities and how generous they are with state based financial aid. Unfortunately lately the recent college grads are having a real tough time finding a job or at least a job in their field. I think part of that is due to many grads having chosen majors that are not in high demand or in fields with keen competition. It appears in hindsight that nearly half, 48%, of the college grads realize after the fact that they made a poor choice of major. At least that was the findings in the report Unfulfilled Expectations: Recent College Graduates Struggle in a Troubled Economy I assume a lot of that second guessing about choice of major is due to being shocked when the 'real world' doesn't fill their email inboxes with job offers. Notice that the 2nd item on the list at 47% is related to internships or more part time work. I had that regret myself when I first graduated from college without any useful work experience. The same study's data also shows that graduates with internships have 24% higher starting wages on average. I'm a little surprised that students didn't regret not having studied harder and partying less, but maybe they enjoyed the partying too much to regret it or maybe those regrets were filed into the 'something else' category. Choice of major is huge and has a massive impact on your future career and employment prospects. If you're going to college or know someone who's doing so then make sure to carefully research and consider the employment prospects of the field in question. Their calculator is neat for a few reasons. It lets you pick any start date and end dates by month and year. You can see the total growth and the annualized returns. They also figure the returns if dividends are reinvested and without dividends. Finally the calculator also has a feature to adjust the figures for inflation so you can see how the return performed in real dollar terms. One good use of the calculator is to compare your own investment returns to the S&P 500 index. I've done this kind of thing in the past with my own returns on my Roth IRA investments. Comparing your return rates to an index is an important step to make sure you're performing well versus a simple benchmark. Lets walk through an example of benchmarking your investment returns to the S&P 500 using the calculator: Lets say you put $5000 into your Roth IRA back in April 2009 and its grown by 45% over the past 3 years. If we figure the compound annual growth rate on that it comes out to about 13%. Thats pretty good right? Who would complain about 13% annual growth? But... how does it compare to the S&P 500? If you use the S&P 500 Return Calculator then you can see how the S&P 500 index compares as a benchmark. Using the calculator I plug in April 2009 for the start date and April 2012 for the end date. I'll leave the 'adjust for inflation' box unchecked since we're not accounting for inflation now. I hit calculate and it informs me that in the same period the S&P 500 was up a total 66.2% with dividends reinvested for annual compound growth of 18.4%. Now that 13% annual return doesn't seem so hot does it? The index beat my returns by 5% annually. You probably have multiple investment purchases spread over time. So rather than having a single IRA contribution in 4/09 you more likely added money in April of 2008, April 2009, March 2010, April 2011, and finally in April 2012. In that kind of case you can use the S&P 500 Return Calculator multiple times to figure the growth of the S&P 500 for each time frame. So if you put $5000 in each year then use the calculator on each date period to see how each $5000 contribution would have grown. From April 08 to '12 the S&P is up 3%. So that $5000 is now worth about $5150 (103% x $5000). From April 09 to '12 the S&P is up a nice 66% so that contribution would have grown to $8300. If you do this for each contribution and add them up you'll get the total growth of similar investments in the S&P over time. You can then compare that to what your own account balance has grown to. Someone could argue that the S&P 500 isn't a great benchmark. That may be true in general but its a basic starting place. For example if your investments are all in safe bond funds then comparing to the S&P 500 is a bit of an apples to oranges comparison. I really wouldn't expect bonds to out perform the S&P500 long term. But its still good to know where your investments fall in comparison to a basic stock index like the S&P. Bargaineering answers the question What is a Lipper Average? DoughRoller tells us Should You Pay Off Debt or Save for Retirement? Have you ever wanted to drop out of society and become a farmer? I've had those day dreams on occasion. Of course I don't know much of anything about farming and I never particularly enjoyed working in my parents vegetable garden. But this raises the idea in my head of a sort of retirement that is an 'off the grid' lifestyle. But this I mean achieving financial independence by having sustainable lifestyle and minimal cash expenses. If you own a home, buy a solar panel for your electricity and grow all your own food in a garden then you could be effectively financially independent with relatively lower up front costs. This kind of lifestyle is probably more along the lines of a hippy commune rather than modern farming. I figured it would be a fun exercise to try and determine how much it would cost to fund such a lifestyle. 1) You'll need to live in a semi-rural or rural area. I'm just going to look at properties in my general area with sufficient acreage. Costs for real estate vary substantially. Ideally for this to work well you might do best by relocating to a low cost area of the country. Furthermore an area with a mild climate and some sun could keep your heat and electricity costs low. I'm not sure what area of the country would work best for this kind of thing, somewhere in the rural South could work well. 2) You'll produce your own food. This will require some acreage and it will take time. 3) I assume you won't have to pay income taxes since your income will be pretty minimal. You won't owe social security or medicare either as you won't have wages. Your tax liability should be close to zero other than a property tax bill. 4) I'm assuming that you are not taking advantage of government welfare programs like food stamps or medicaid. Its possible you might qualify for such programs if your income and asset levels are below thresholds but I wouldn't want to plan nor be dependent on government handouts. 5) For any ongoing expenses I will assume that money in the bank can be drawn out at a 4% rate and that it will last forever. This is not a 100% safe assumption as a small % of the time you can run out of money. Alternatively I could figure on buying an immediate annuity if you're old enough and that will help you manage expenses indefinitely. 6) I'm generally assuming a frugal lifestyle with basic necessities and no frills. I'm sure there are various expenses that people would want to add to what I list here so keep in mind I'm not trying to cover everything for everyone. Some expenses can be crossed off by up front capital spending and others are going to require monthly spending. I'm not going to make my own toilet paper or evade paying property taxes so a certain amount of spending is unavoidable. These are the expense categories that you could cover via one time costs. For example if you buy a house outright then you dont' have to pay rent or mortgage payments in the future. Or if you buy solar panels you won't have to pay for the electricity. Housing - Buy a home with land. Garbage - Recycling, composting and burning. Property taxes - No way around this usually. Might get discounted rate for rural farming use, low income or homestead. Auto insurance - Insure just one car with cheapest plan possible. Auto repair / maintenance - DIY everything possible. Household items / clothing - You could be a total cheapskate on some of these items but at some point you need to buy some new clothes somewhere and I don't think theres good free alternatives to buying some toilet paper. Internet -You could pay anywhere from $20 to $50 for typical internet plans. Internet service could provide multiple benefits such as phone via VOIP or entertainment via online steaming. Phone - A cheapo pay-go cell phone will run you $5-10 a month. Barebones landlines are usually in the $20 range. Housing - I found a house with a 5 acre lot for around $100k to $150k range. That will cover your food and housing in one. This is not a fancy house at all and is likely to need some repairs. Depending where you live, if you shop around you can likely find cheaper housing with acreage in rural areas. Electricity - A quote on FindSolar.com says that a solar array to cover electricity use of $80 per month in my area would cost me about $30k after tax incentives. If I put $24k in the bank and drew it down at 4% rate then I would have enough to spend $80/mo or $960 a year on electricity. Given that math I'm better off just buying electricity from the utility. However I could get a smaller array 1/4 the size for just $5000 after taxes and cover 25% of the cost. I could combine a $5000 solar array and $18,000 in the bank and cover my electric costs for total cost of $23,000. Wind turbines could also work if you live in a relatively windy area. A 900W turbine could cost around $3000. Heating - I could heat the house with electricity. That would roughly double the electricity needs and cost me another $24,000 if I just bought electricity from the utility. Or I could buy extra land and harvest wood to burn in a fireplace. Another property with 16 acres instead of 5 acres costs about $180k or $30k more than the 5 acre home. So that extra 11 acres is about $30k more. $200,000 total would cover a house with 15 acres of land and a solar panel that would generate all my electricity and heat needs. Health Insurance - The cost of health care is a potentially huge problem to account for long term. Health costs have been rising faster than inflation for a while and this is one category that is hard to plan for. I'm not going to try and solve that here but I'll just estimate a relatively cheap health care costs and cross my fingers. Of course if you were to do this for real then planning for your health care costs would be a major item that I wouldn't just ignore or hope for the best. But I'm just doing this as a thought exercise so today I'll ignore the huge looming problem of health costs and figure for basic health insurance coverage. Ok... enough disclaimer... Shopping at eHealthInsurance I find policies that would cover a family of 4 with a large deductible. Monthly premiums are around $350 and the deductible + maximum annual out of pocket runs $5000 to $10,000 range. If I wanted to cover that $350 monthly premium out of pocket indefinitely then I'd have to have about $105,000 in the bank. The cheapest plans run $200 to $250 a month but they have deductibles totaling $20k for a family and out of pocket maximums around $50k. Either way I figure I'm looking at $125,000 in the bank to indefinitely cover health insurance and out of pocket costs. Property Taxes - If I assume that the property tax is a straight 1% of the property value then I'd be spending about $2000 a year on this tax. $50,000 in the bank would cover that indefinitely. Auto insurance, gasoline and auto repair - I'm sure many people would argue that a car isn't necessary for such a lifestyle and I understand that. I however have always had a car since I've been 16 and I would prefer to keep the ability to drive. A car can also be a virtual necessity in a rural area. If I drove one car and had nothing but liability then the auto insurance would probably cost $300 to $500 per year. I'm going to assume $450 just to pick a number. Very minimal driving of just 20 miles a week would add up to only about 1000 miles a year. If I bought gasoline that would cost $200. Repair and maintenance will also cost a bit, but if you DIY all that then you just have to pay for parts. I'd estimate another $250 annually for repair/maint. All in thats about $900 per year for the car costs. $22,500 in the bank would cover all the auto costs for one cheap car driven minimal amount. So far I've got a running total of nearly $400,000. Half of that would be spent on a house and electricity generation. The other half would be set aside in the bank to cover future costs for health insurance, automotive and property tax. If you throw in another $100,000 in the bank that should give you money to cover the other items like household expenses, toilet paper and some optional spending on an internet connection. I figure that $500,000 in up front and ongoing spending could potentially cover a semi 'off the grid' and back to the land semi retirement lifestyle. Of course this is just an example and I'm sure the costs will vary pretty drastically based on where you live and the details. Do Automatic or Manual Transmissions get Better MPG? It used to be that manual transmissions were the hands down winner for better fuel economy. However this is no longer the case. Modern automatic transmissions are more and more efficient. Todays automatic transmissions can even provide better gas mileage than a manual version. There is no clear cut winner. Depending on the make/model of vehicle its possible that either the automatic or the manual transmission could provide the better gas mileage. Here's just a couple examples. I looked up the cars in question on the government Fueleconomy.gov website. Below are screen captures of the results. 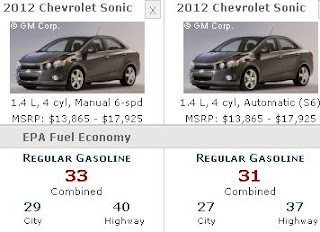 First the Chevy Sonic is one car where the manual transmission has better efficiency. 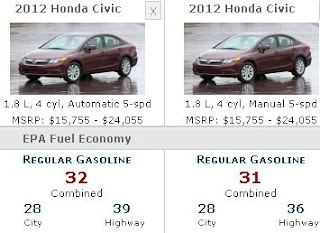 On the other hand for the Honda Civic the automatic transmission is better. You can no longer assume that a manual transmission will provide better mileage. It really depends on the vehicle in question. About a year ago now I wrote a series of articles in my Adventures in Couponing part 1, part 2 and part 3. Back then I had a free subscription to the local newspaper for a few weeks so I tried out clipping coupons. The end result was that I saved only $13 total which wasn't really enough to pay for a newspaper subscription. Since then I've continued to use coupons in a more limited fashion while grocery shopping. Basically I collect any coupons that I can find that we might use. The other day I had a $2 coupon and a 75¢ coupon and saved $2.75 in one grocery trip. 1 ) Easy and free sources for coupons. Cash register coupons - these are coupons that are printed out for me at the check out. They are targeted at us based on our purchase history in the store. Most of them are for products we use but they are often not brands we want. Sometimes they are the exact brand we want and buy so they can be a no brainer. Promo coupons from our rewards card - About once a month the store we shop at sends out a mailing to our home with coupons targeted at us. Sometimes they can be great deals and they are often for brands we already buy. Coupon circulars in the mailbox - While we don't get the newspaper we still get coupon circulars from companies like RedPlum in the mailbox. When I get these I take a minute or two to flip through them and grab the coupons for brands and/or products we use. Newspaper ads in store - Our grocery store has their newspaper ads available in the store so you can still get their store coupons without the newspaper subscription. Coupons loaded on rewards card - Our grocery store also has a mechanism online where I can load manufacturers coupons to our rewards card. Then when I'm checking out the coupons are automatically credited without the need for me to clip and redeem a physical paper coupon. Online Printable Coupons - This is a good source that I don't actually use myself. There are many websites that you can get free coupons from to print out. One reason I haven't done so is that the manufacturer coupons are often redundant so I see the same offers in the mailbox or via my online rewards card. One minor downside to online printable coupons is the cost of paper and ink you use to print them out. 2) Spending minimal time. I don't spend much time saving and organizing coupons. I have been simply stashing any coupon we might use in an envelope. Then when I am in the store I'll skim through the coupons to see if anything matches my shopping list. Added all up I probably spend 5 minutes or less per week to collect and use my coupons. 3) Targeting items we use or might use. I only save coupons for items we normally buy or ones we might buy. I am not too flexible on our coupon use. We do not change our purchase habits much in order to save money via a coupon. For some brands I'm flexible but for others I insist on specific brands. For example I am flexible on facial tissue and will buy Puffs or Kleenex based on whats on sale so a coupon for one or the other may sway our choice there. On the other hand I only buy a specific brand of dental floss called 'satin' because its what works best for me. 4) Limit myself to one store. I do not drive around town visiting multiple grocery stores to chase coupon bargains. In my Adventures in Couponing experiment I only saved a few dollars per week maximum and that was with the use of newspaper coupons. I figure that driving around to multiple stores would cost more more in gasoline and time than its worth for the marginal increased savings I'd get. If I put in a lot of time and maximized my return on coupons then it may make sense to make trips to specific stores, but as it is my minimal effort system doesn't warrant it. I probably save $1 or $2 every couple trips to the store this way. Thats not a lot of money but it is pretty good return for 5 minutes of easy work. If I wanted to spend more time then I'm sure I could save a bit more money. I could also save more money if I wanted to be more flexible in our purchases. There are a lot of pets in the US. The other day a commenter on another blog said that they thought the rate of pet ownership was going up. So I decided to research that and quickly found some data on the Census bureau. I found a document with figures for 1981 to 1996 and newer documents with the 2001 numbers and with more recent year 2006 numbers. The census data shows dogs, cats, horses and birds separately. It doesn't discuss what % of homes own any pet. The range must be between 40% and 70% based on how many of the dog an cat owning homes overlap. 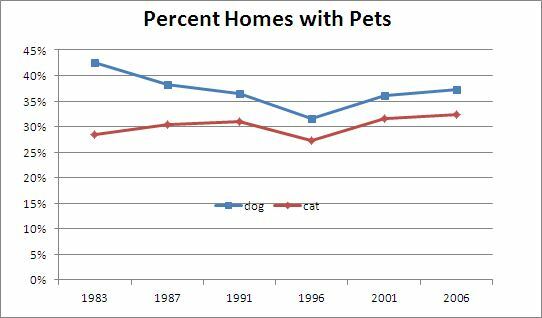 Its hard to know how much overlap there is between homes with dogs and cats or other pets. 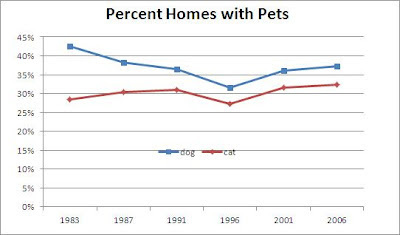 I'd bet that there is a fair amount of overlap between the figures as there are a lot of homes that have both a cat and a dog. But there are also a lot of homes that have only one or the other. I am guessing that something around 50-60% of homes have a pet of some sort. I'm going to show the data for dog and cat ownership below. The % of homes with birds and horses is around 4% and 2% respectively and if you want more detail you can visit the Census links above. This is the data for all homes. The % pet ownership rates also vary based on income levels and the # of people in the homes. fivecentnickel recently asked Is it Time to Switch to LED Lightbulbs? My answer to that question is 'no'. In short, LED bulbs are still to expensive. Nickel pointed to one bulb for sale on Amazon with a cost of $32.99 (+6.99 shipping). It claims to last 50 times as long as conventional lighting. I found another bulb for under $19 (+2.5 ship). That one has a lifetime guarantee. Whether they cost $20, $30 or $40 thats still too expensive. A typical CFL (Compact Fluorescent Lamp) can be bought for around $1-2 nowadays. The CFLs last around 5-10 years. You could buy a 10 pack of CFL's for $10 or $20 and they would last you 50-100 years total. On a cost per year basis the CFL is still cheaper than the LED even though the LEDs last several decades. Theres another good reason to delay on buying a LED. In the future the cost of LEDs is likely to drop further. As the technology matures and they become more commonly used the prices will drop. Its quite likely that in a few years LED prices will be well under $10 and may approach the cost of CFL's today. LEDs may be a great technology but right now they simply cost too much.